For 9 months leading up to my wedding, I worked full-time as the main customer service person at the nearest Bed Bath & Beyond to me. No, it wasn’t a great job, related to my field, or particularly fulfilling, but I did learn a lot about how to set up your home. Here is a standard checklist from TheKnot.com, which as some great references, but there are some pitfalls. If you’ve been living on your own or together for a while, you probably already have lots of these things. You have two routes: request replacements/upgrades of your current stuff, or stick with what you have and save gift requests for things you wouldn’t/couldn’t buy on your own. For instance, my brother and sister-in-law had a terrible toaster that burned the toast all the time since it was like 20 years old. They registered for a new one. However, their microwave was fine. Why bother asking for another one? Sometimes your parents, in-laws, or someone else will try to pressure you into requesting gifts that you don’t foresee yourself using. Stay strong. If it’s a gift they really want to give you, compromise is fine. If it’s something they think you need, but wont’ get you, why do they want you to get it? It’s just a waste of someone else’s money. Nic and I did our registry at my store, and the whole time my managers were pressuring me into registering for china. They figured I would regret not asking for it, and that the IKEA set we wanted would not cut it. To get them off our back, we put it on the registry. Later that night I logged in and deleted it all. I have half of the Royal Dalton Old Country Rose set, and Nic doesn’t like it. Why would I bother getting more or another set? My plan for the long run is to mix in nicer pieces with the IKEA ones, which fits our current lifestyle. I will admit that a KitchenAid standmixer was the first thing on my list, and I was super pumped when I found out that my Dad’s family bought ours for us! No, they’re not necessary. Have I loved it completely? Yup. But you don’t need one. If you’ve never made juice in a Magic Bullet, you don’t need a juicer. Neither of you bake? You don’t need very much baking stuff. As greedy as it sounds, the registry should be things that you really want. Don’t fill up a registry of things people are buying for you with things you don’t actually want. Some guests might remember what they got you, and when they visit, will be happy to see you’re using the item on a regular basis. Nic and I needed towels, sheets, some cooking stuff, so we registered at Bed Bath & Beyond. However, we also registered on ehoneymoonregistry.com and MyRegistry.com. Honeymoon registries are super cool: if you’re planning a honeymoon, you can get some of your activities paid for! Our camping in Cape Breton was covered, we got money for dinners and ice cream breaks, and whale watching. Writing those thank you cards were so much fun, because we had such a great time doing it all. Honeymoon registries are even more helpful for couples who already have all their home stuff, and don’t want to just get cash. We used MyRegistry because we wanted a universal registry where we could put our camping supplies from MEC, various items from IKEA, and our Nikon DSLR fund. If you don’t have a specific store you want many things from, this is super helpful, and makes sure gifts aren’t doubled. Are you super into rock-climbing and want some more gear for the two of you? That’s your time, and guests love to give gifts they know you’ll really enjoy. Like to go to art galleries? Request year memberships to places on your universal registry. The sky is the limit. If you only have gifts above $100, you’d better hope all your guests are rich. For the rest of us normal people, you need to have a variety of budgets so that no one is uncomfortable. Once I knew some ladies from my church were throwing me a bridal shower, I added some cheaper baking supplies that were $5-20 so people could choose whatever they were comfortable spending. For most of my friends, we all spent an average of $50 per person, so we had a bunch of gifts that were around that range. Relatives who could spend more chose the pricier items (standmixer, towel sets, sheet sets). Don’t be like many of my friends who requested super expensive dishes, got maybe 2 dinner plates, one soup bowl, and no cutlery. If you request only expensive things, your guests won’t be able to buy them for you unless they all go in together. And you’ll be stuck eating on your old dishes. Giving wedding gifts should be a fun process for the guests-it’s always exciting (for me at least) to look at what they’re asking for, and see if I can top up the gift with something special (gift receipt included, of course). It comes down to being considerate of your guests’ budgets, what will help you and your partner set up your home together, and what the two of you find important in your lives. Make sure to write in a spreadsheet what gifts you got from whom so you can write a thank you card or email-one of the wedding traditions that I hold firm to! I wanted to make Nic a gift for us for our wedding, and started this throw pillow during the spring. I got distracted by other wedding preparations, and then lost the bag that it was kept in, until a few weeks ago. 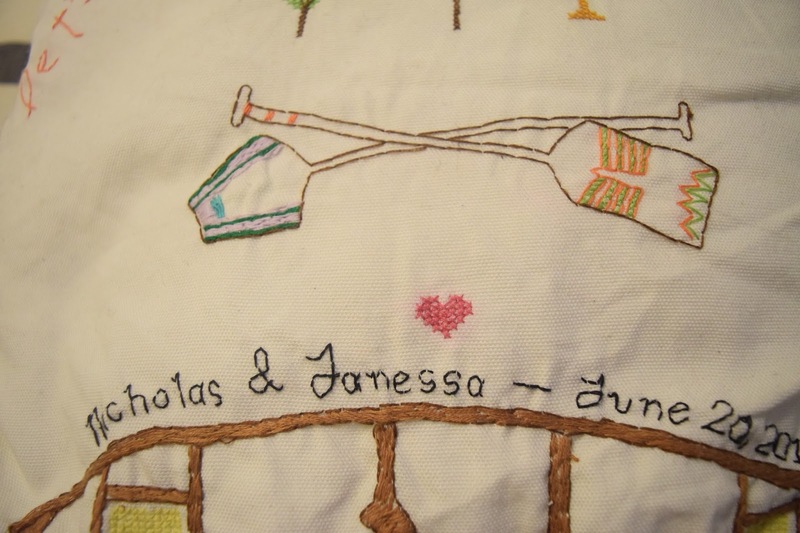 My goal was to make a kind of kitschy pillow to commemorate the wedding, and I kinda like how it turned out. 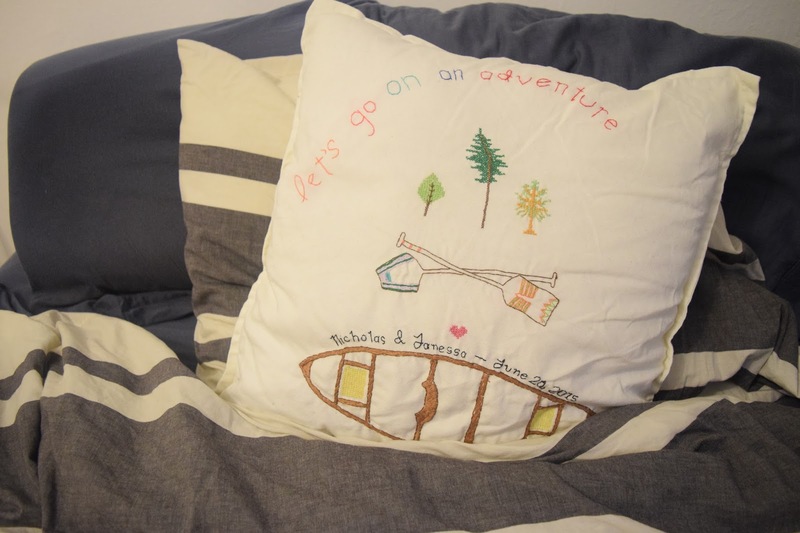 I used a linen throw pillow cover from IKEA as well as their inserts. It’s 20×20″ and looks great on our bed. 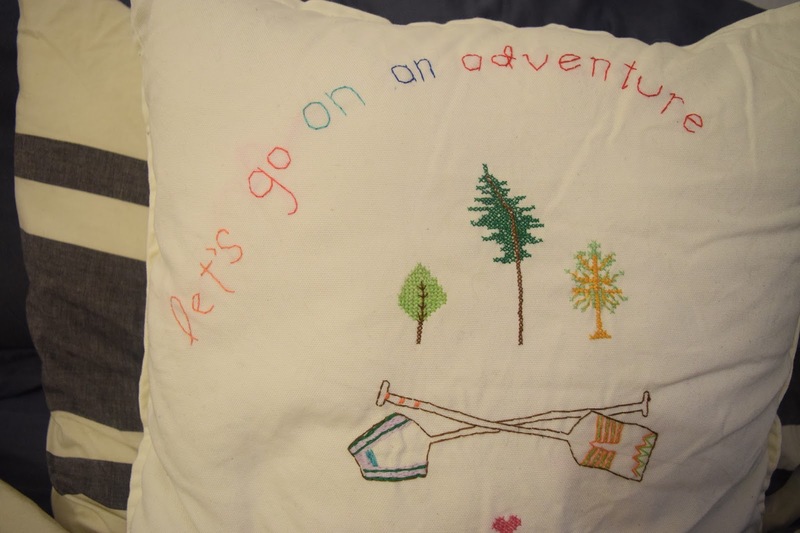 Fun story, I originally embroidered “June 21, 2015.” That’s wrong. We got married on the 20th. Oops.